With the exception of the Mac mini and the Mac Pro, iSights are now de rigueur across the Mac line. And applications like Photo Booth and iChat AV have made video not only a marquis feature of the platform but part of many Mac users’ everyday lives. But despite the years of iSight integration, Apple still hasn’t provided better controls for adjusting the iSight’s image. That’s just fine with the folks at Ecamm Network. When last we visited their popular iGlasses software, the fledgling add-on for enhancing your iSight camera’s image had just left the nest and ventured into the big wide world. Almost three years later, Ecamm has at long last launched iGlasses 2.0 ( ; $10) with new features as well as expanded support for cameras and applications. And to top it off, iGlasses 2 incorporates a streamlined new user interface that makes it easy and intuitive to access its myriad features. Once you’ve installed the program, you’ll find a new “iGlasses Settings” entry under the File menu in most apps that support the iSight camera, such as iChat, PhotoBooth, or iMovie. This summons iGlasses’s little floating control window. In its default mode, iGlasses gives you the ability to choose between standard video or one of a handful of preset image adjustments, such as improved brightness, enhanced colors, black & white, and sepia tones, as well as a collection of presets that you can define. These presets are probably all most people will ever need to get the most out of their cameras. But you’ll find the app’s real power when you slide open that control window’s bottom drawer. There you’ll find a second pop-up menu that gives you direct access to image qualities such as brightness, contrast, color balance, sharpness, saturation, white balance, and more. You can even rotate your camera’s image in 90° increments, in case you want to mount your external iSight on the side of your computer (or set your MacBook or MacBook Pro on its side), or mirror the camera image left-to-right in case you want to use something like the nifty Huckleberry mirror that Ecamm sells (which itself comes with a copy of iGlasses). You can can adjust as many of these factors as you like, layering one change on top of another until you’re happy with your image. Once you’ve tweaked the image to your liking, you can save a custom preset encompassing all those changes. For example, you might want to adjust your white balance and brightness settings for the different types of lighting in different locations: one for your home, another for your office. You could save a custom preset for each and easily pick the appropriate one when needed. You might also decide that you want different settings for different applications; for example, video conferencing via iChat vs. scanning items into Delicious Library. iGlasses 2 also adds the ability to rename and remove individual presets. Of all the new features in iGlasses 2, though, my favorite might seem kind of silly, but it has its uses. By selecting the Zoom and Pan option, you can control the framing of your iSight image, adjusting the zoom slider and dragging around the selection rectangle to show only the portion of your image that you decide. This could come in handy for stay-at-home workers, such as myself, who may occasionally have video conferences in, shall we say, less than professional surroundings. By playing with Zoom and Pan, I can move the focus onto myself instead of my background, and my chat partners will be none the wiser. Of course, this processing is done completely digitally: neither internal nor external iSight cameras have zoom lenses built in. It’s worth noting that iGlasses has different capabilities depending on whether you’re using an external iSight, an internal iSight, or one of the other Webcams compatible with the program, such as Ecamm’s own iMage USBCam. For example, only the external iSight supports the Macro Focus preset and the Shutter, Manual Focus, Edge Enhancement, Gain, and Temperature controls; the built-in iSight, on the other hand, has an Exposure Lock preset and can control Color Balance. Although iGlasses is available in most iSight-compatible programs, you may not always want it lurking in the background. Fortunately, when you install iGlasses it also drops a small helper app in your Applications folder, iGlasses Manager, that allows you to disable the iGlasses menu command in specific apps. The only real change that some might consider negative from the original iGlasses to iGlasses 2 is that the program’s price has gone up. But when you consider how much you get, and the fact that it jumped only $2, from $8 to $10, I think you’ll still agree that it’s well worth the extra money. 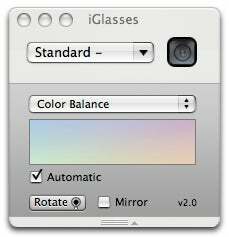 iGlasses 2.0 requires Mac OS X 10.3.9 or later and is a Universal binary.